The National Association of Realtors® (NAR) is working to protect the threatened Mortgage Interest Deduction for homeowners as reported in their April Issue of On The Hill. 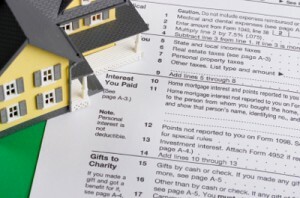 When it comes to tax deductions, every little bit helps beleaguered home owners. By now, everyone’s heard about the 2009 First Time Home Buyers Tax Credit (Form available here), one of the 10 key features of the 2009 American Recovery and Reinvestment Act. But, even if your not a First Time Home Buyer and if you are a home owner in Chester County or the Main Line Pa area who has recently purchased or sold a home, don’t forget to ask your Accountant about some of the benefits of home ownership that Uncle Sam traditionally offers to encourage home ownership. *origination fees/Points such as fees paid to get a lower interest rate, but those that constitute a “service fee” may not be deductible. *Pro-rated real estate taxes – be sure to ask about deducting your fair share whether you’re a home buyer or a home seller. *Pro-rated mortgage interest may be deductible. And depending on whether you closed early in the month or later, it could be more or less of a deduction. *Expenses incurred to prepare your home for sale should be documented for your tax preparer especially if you sold a primary residence. Is your HUD-1 Settlement still packed away with the moving boxes? Just give your Realtor® or Title Company a call. If you worked with me, Prudential Fox Roach Realtors and Trident Land Transfer, we’ll be happy to get you a copy. Each year I email Settlement HUD-1 copies to clients to help with tax return preparations. *For informational purposes only. Consult your professional tax specialist or Accountant for all tax preparation advice. Contact or call Judy Peterson Realtor 610-889-5509 Prudential Fox and Roach Realtors Devon Home Marketing for the best internet savvy real estate services in the communities of the Philadelphia Main Line and Chester County Pennsylvania area. Judy Peterson is your internet real estate specialist offering “Superb Service,and Superb Results”. This entry was posted on Monday, April 6th, 2009 at 4:56 am	and is filed under Financial, First Time Home Buyers, Home Buyers, Home Sellers. You can follow any responses to this entry through the RSS 2.0 feed. You can leave a response, or trackback from your own site.